Continue on out of Brooklin and wend your way toward Sedgwick. As you cross the Benjamin River bridge, notice the three pastel colored houses on the left bank. They are the oldest homes in town, and one of my favorite views on this trip. In the village, is the tiny Sedgwick Library, and just around the corner is Sedgwick Antiques – well worth a visit. And don’t miss Pushcart Press’s little bookshop, located just behind the antiques shop, offering an interesting array of books, some at reduced prices. Now, it’s time to make an about face, and head back into Sedgwick to continue our tour… But, before we leave town, look for the sign for Mermaid Woolens and Summerbeam on your left. Betsy Coakley’s amazing sweaters are like the “coat of many colors” ­– if it was hand knit, that is. Not far out of town, slow down at the sharp left turn and take a right to stop in at R Place Studio to see potter Kathy Burton’s work. As you drive, you’ll catch occasional glimpses of Eggemoggin Reach on your left, with the north shore of Deer Isle on its other side. Watch for the sign for Eggemoggin Textile Studio on your right about a mile past the sharp bend in the road on the way out of town. Chris Leith spins and dyes her yarns, then hand weaves some truly exquisite scarves, wraps, pillows, and hangings. She also has fine work by other textile artists, and she offers workshops all summer in a variety of textile techniques. Take a right at the junction of Route 15. Just past the turn, on your right, you’ll see the sign for El El Frijoles – a great lunch or dinner spot featuring chef Michele’s take on taqueria fare. Step into what feels like a Mexican cantina to order, and enjoy your food there or take it to go. When you head on up Caterpillar Hill, there’s a great scenic turnout, and Caterpillar Hill Gallery on your left. Stop in, see what Kelly Mitchell has on the walls, and check out the fabulous view before heading on. If you are looking for a quiet place to walk, turn left onto Cooper Farm Road just before the overlook at the top of Caterpillar Hill. You can park and walk along the gravel road through blueberry fields and into the woods, or drive all the way to the end and take a dip in Walker Pond at the public boat launch area. Continuing on Route 15, you’ll soon come to the location for Millbrook Baking Company – a great restaurant offering breakfast, lunch, and dinner, with some of the best homestyle cooking around. A great stop for creative, tasty fare that will satisfy the entire family. Just beyond Millbrook – on the left, and easy to miss – is Sanctuary Cove, a lovely hiking trail owned and maintained by Blue Hill Heritage Trust. 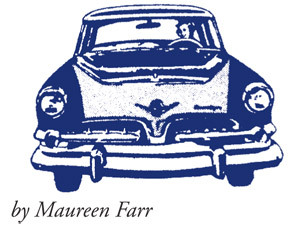 There is off-road parking for two or three cars, a map of the trails that take you through the woods to the shore of the Bagaduce River. Head back south towards Deer Isle, and watch for the sign for Bucks Harbor to your right. Make this turn and you are in for another great drive. First stop, take a right on Coastal Road and check out Ecouture Textile Studio, located in the former Island Soap location. Offering beautiful textiles, as well as classes, this newcomer to the neighborhood is a great stop! Don’t miss a visit to Galen Davis Studio, right on the corner of Coastal Road for a delightful look at original paintings. 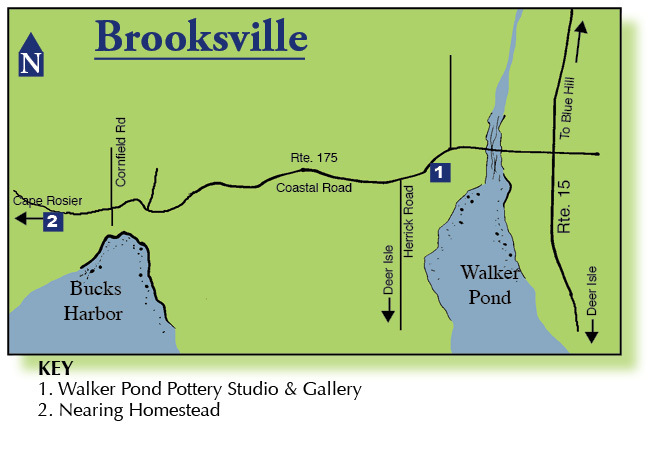 Back on the road, watch for the sign for Walker Pond Pottery Studio and Gallery on your left just past the cemetary. Potter David McBeth’s works are functional, solidly made, and will look good in any setting. Also watch for Sow’s Ear Winery, on your right about a mile and a half along. Tom Hoey makes some of the best fruit wines around. If Tom is around, you might find yourself in an interesting conversation about … who knows? Meandering on down the road, you soon come to Bucks Harbor. Condon’s Garage, made famous in Robert McCloskey’s book, Blueberries for Sal, sits on your right as you come downhill into town. The Bucks Harbor Market is a good place to stop for a cooling drink, some lunch, or supplies for a picnic. They sell local, fresh vegetables all summer, good cheeses and wines, and have a great butcher counter, as well as the usual groceries. Bucks – the restaurant behind the market – offers what Chef Jonathan Chase refers to as “comfort food” to patrons. A great place to meet friends and enjoy a good meal. Back in the car, continue to wend your way out to Cape Rosier. Take a left at the sign for Cape Rosier, about 2 miles from Bucks Harbor, and follow along the pretty wooded road until you get to the Rosier Grange. Taking a left at the grange will send you towards the water, still on a beautiful wooded road. You’ll see some lobster boats moored in the cove. Continuing on for less than a mile, you’ll come to a beach on your left. This is a good place to stop for some sunbathing, a picnic, or to put your feet in the water. Moving along again, go up the hill, through the blueberry field and into the woods once more. After a lovely meander through the woods, and past Four Season Farm (unfortunately, still no farmstand) keep driving until you come to the Nearing Homestead – on your right almost to the little Harborside community, and just before the road opens to the water again. Of course, you can always split this fun drive into TWO afternoons!